Antibiotics can shorten the length of throat infections by between half a day and one day on average. But they can have side effects, and using antibiotics too much increases the risk of bacteria becoming resistant to them. 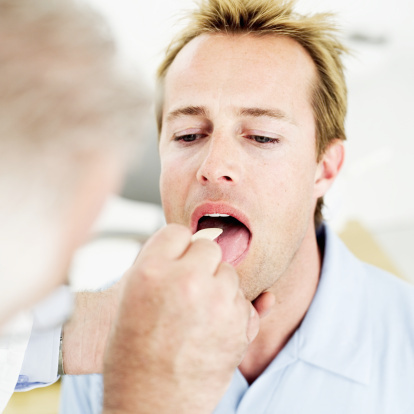 A lot of people go to the doctor because of a sore throat – particularly in the cold season. Sore throats are often caused by a common cold, and sometimes by a throat infection or a tonsil infection (tonsillitis). People may then wonder whether or not to take antibiotics. But antibiotics won't help in most cases: Sore throats that are part of a common cold are usually caused by viruses, and antibiotics don't fight viruses. Antibiotics only help in people who have a bacterial infection, such as bacterial tonsillitis. Most sore throats go away on their own within a week anyway, without any special treatment. Certain symptoms suggest that the sore throat is being caused by a bacterial infection. If you have a fever and swollen tonsils with a coating of white or yellowish spots on them, but you don't have a cough, you could have bacterial tonsillitis. Doctors can find out whether it's bacterial using a throat swab to get a sample of secretions from your throat or tonsils. The sample can be tested straight away in what is known as a rapid test, but the results aren't very accurate. They are somewhat more accurate if the sample is sent to a lab and checked for bacteria there. This is hardly ever done, though, because it takes 2 to 3 days to get the results back. So antibiotics are usually prescribed based on symptoms alone, if the throat infection is suspected to be caused by bacteria. This means that a number of people who take antibiotics don't benefit from them because their sore throat is caused by a viral infection. Because antibiotics are often used for sore throats even though it isn't clear whether bacteria are really to blame, it would be interesting to known how effective this medication is. Researchers at the Cochrane Collaboration (an international network of researchers) analyzed a total of 27 studies including more than 12,800 people. In these studies one group of people took antibiotics and another group took a placebo (fake medicine). Most of the study participants had signs of a bacterial infection. The following results do not apply to people who have milder symptoms that are probably caused by a viral infection. About 80 out of 100 people who didn't take antibiotics still had a sore throat after three days. About 55 out of 100 people who took antibiotics still had a sore throat after three days. About 40 out of 100 people who didn't use antibiotics still had a sore throat. About 20 out of 100 people who used antibiotics still had a sore throat. In some of the participants a swab test detected certain bacteria that can cause bacterial tonsillitis. The antibiotics were a bit more effective in that group of people. The studies also showed that antibiotics can prevent complications such as middle ear infections. People who take antibiotics are also less likely to develop a different complication called quinsy (also known as a peritonsillar abscess). This is a build-up of pus beside a tonsil. But these and other complications are rare in people who are otherwise healthy, even if they don't take antibiotics. They occur in less than 1 to 10 out of 1,000 people who go to a doctor because of their symptoms. Antibiotics can have side effects too, though: Other studies have found that about 10 out of 100 adults experience side effects while taking, or after taking, antibiotics. The most common include diarrhea and rashes. What's more, using antibiotics too much and even when treating less serious medical conditions can cause bacteria to become resistant. This means that the bacteria are no longer killed by the antibiotics. As a result, a lot of serious medical conditions can no longer be treated as successfully as before.